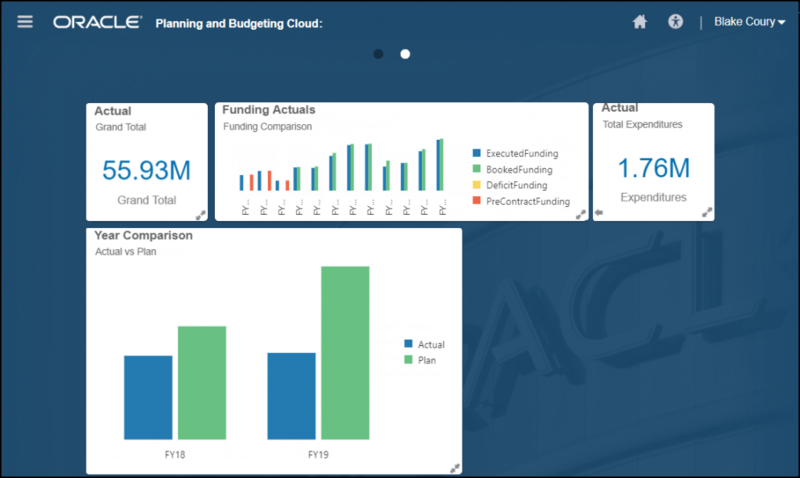 Oracle Planning and Budgeting Cloud Service (PBCS) continues to help companies plan and forecast more accurately, and Oracle continuously invests in improving the efficiency of PBCS as well as adding new functionality through various monthly releases. Have you ever wanted to view your data at an aggregated higher level to display pertinent information about your company at a quick glance? If so, one of the recent releases allows for users to view snippets of high level data in a more effective manner through the use of a data visualization tool called Infolets. 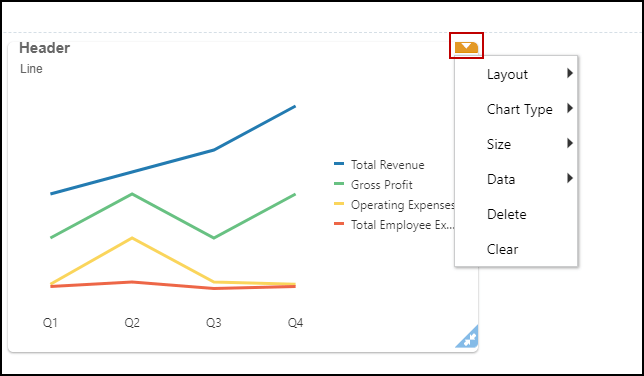 Unlike Dashboards, Infolets let users alternate between three charts or sets of values for each section, allowing for more data to be stored in one location. With the click of a button, users can switch between other charts and information to critically answer questions by providing them with appropriate data. Infolets allow users to view information using various charts, and alternate between multiple charts or sets of data within an interactive box-shaped container. With the click of a button, users can flip between three sets of values or graphs within one infolet and resize their Infolets, enabling them to critically answer questions. However, Infolets are not meant to serve as a replacement for complex reports or any detailed visuals. Infolets are designed to provide a summarized level of detail to users in a visually rich manner. Infolets can be designed to incorporate different user roles in PBCS, protecting sensitive data. 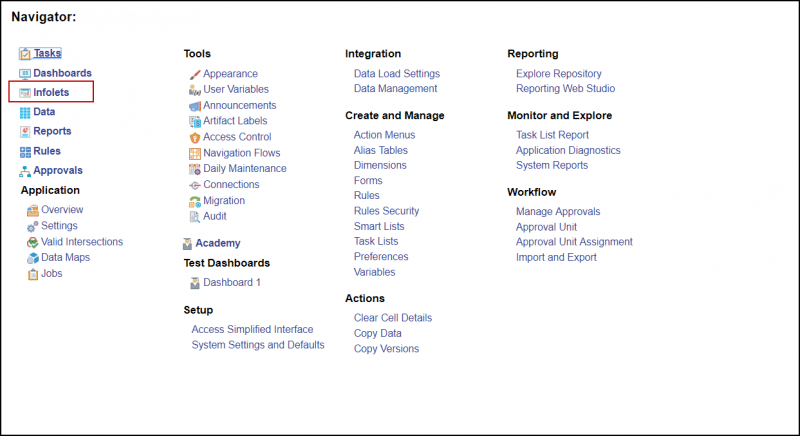 Now that we’ve gone over some basic info, lets walkthrough how to create and access Infolets. Infolets can be created and managed through the Infolets icon in the PBCS Navigator. Changes to any existing Infolets can be done here, though for our example, will walk through how to create an Infolet from scratch. To get started click on “Create”. If you are familiar with creating Dashboards, this next screen will look very familiar. You can either begin by dragging the Web Form that will be used as the basis for the Infolet by clicking on the first tab, or by clicking on the second tab and dragging the chart that will be used in the Infolet. As you begin to drag and drop multiple Web Forms onto the Infolet, you will notice that there are three views for each Infolet. You are NOT required to use all three views, rather you can use any combination of the three views that you wish. The views are: Regular, Flip, and Expanded. Expanded is the largest of all the views and provides great benefit when dealing with larger graphs or visuals. You can also edit the Layout, Chart Type, Size, and Data that the current Infolet is using by clicking on the menu drop down (yellow arrow on the top right of the Infolet). After all the charts and graphs have been created on the Infolet, we can now add the new Infolets to the navigation flow. Navigation Flows can be accessed through the Navigator button, under the Tools section. Open or create a new Navigation Flow, and then click on the second tab on the left side of the screen to add Infolets. Click on the “+” and enter in the appropriate name. 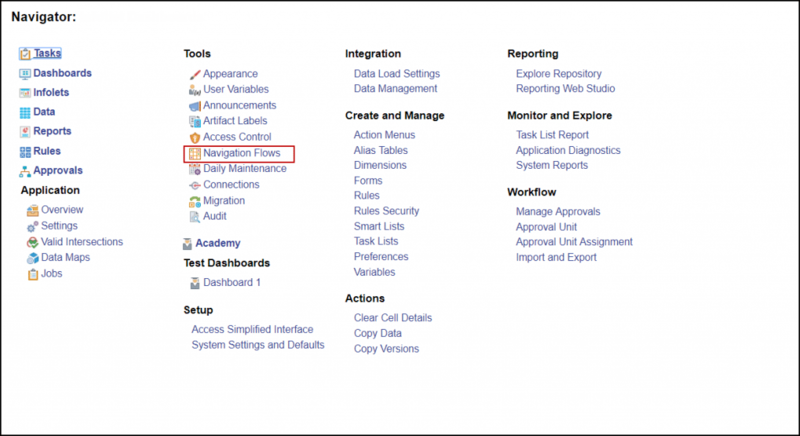 Then make the new navigation flow active and click “Reload Navigation Flow”. 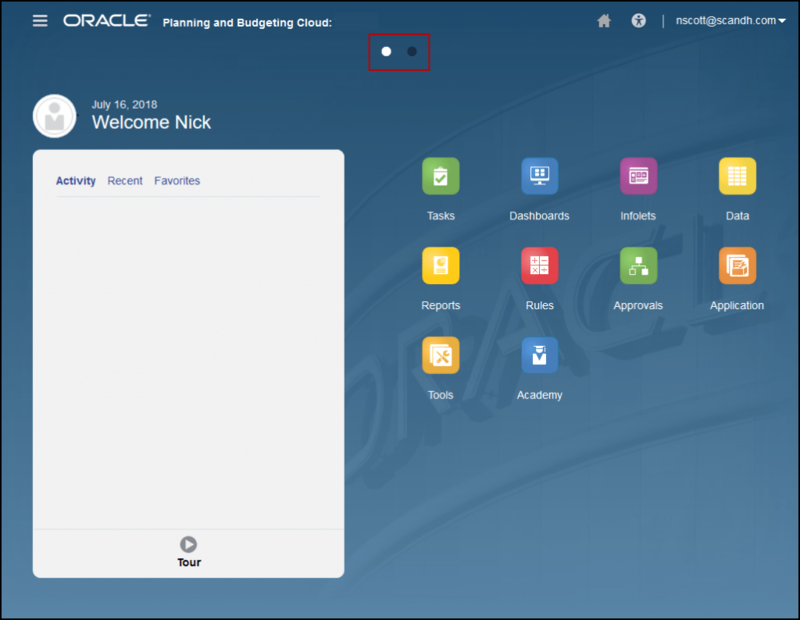 Once the navigation flow has been reloaded, there will be multiple dots in the middle of the PBCS home screen. This will indicate the number of Infolets that are available for a given user to select. The first dot is the standard home screen. The second dot is the default Infolet, followed by any additional Infolets. To switch between Infolets and the main PBCS home screen, simply click on the dot. 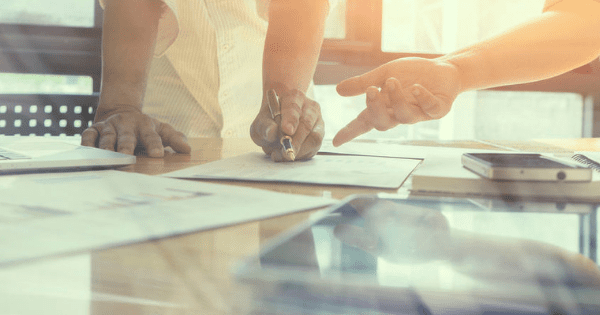 While Infolets are a recent addition to the ever expanding world of PBCS, it is important to differentiate this functionality from Dashboards. Infolets are mainly used for quick, summary level data visualization, while Dashboards serve a wider range of functionality. Not only can Dashboards display data through various graphs, Web Forms, Reports, and charts, but they also contain various Web Forms for users to input data. They can even be combined with Infolets to allow for users to quickly alternate between the two in an easy and convenient way. When considering if you should use an Infolet or Dashboard, the questions that should be asked are: “How do I need to view my data? And do I need to quickly view it in a variety of different ways without switching between various screens? If the answer to both these questions is a profound yes, then Infolets are the right solution. Now that you’ve got the info, let’s go create some!